Ref. 2483 ?Pink? Patek Philippe & Cie, Genève, No. 723605, case No. 676541, Ref. 2483. Made in 1954, sold on January 28, 1955. 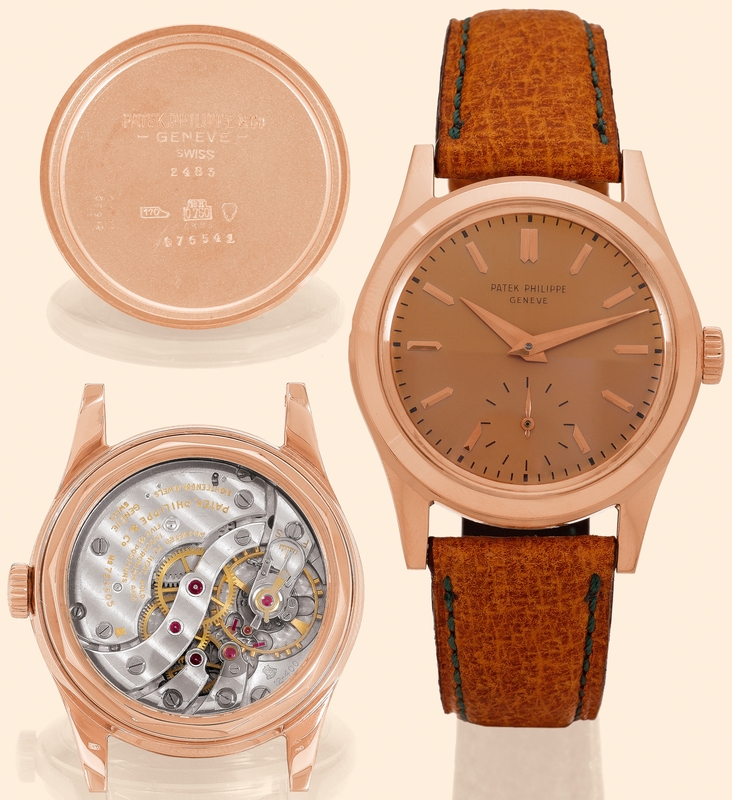 Very fine and rare, water-resistant, 18K pink gold gentleman?s wristwatch with a transparent back and an additional solid pink gold back. Accompanied by the Extract from the Archives. C. Two-body, solid, polished and brushed, screwed-down transparent case back, dust protecting cap, wide sloped bezel and lugs. D. Pink with applied pink gold faceted bâton indexes, subsidiary seconds dial. Pink gold "Dauphine" hands. M. 12-400, stamped twice with the Seal of Geneva Quality Hallmark, rhodium-plated, "fausses-cotes" decoration, 18 jewels, straight line lever escapement, monometallic balance adjusted to heat, cold and isochronism and five positions, self compensating Breguet balance-spring, swan-neck micrometer regulator. Dial, case and movement signed. Diam. 34 mm. Thickness 10 mm. C. Two-body, solid, polished and brushed, screwed-down transparent case back, dust protecting cap, wide sloped bezel and lugs. D. Pink with applied pink gold faceted bâton indexes, subsidiary seconds dial. Pink gold "Dauphine" hands. M. 12-400, stamped twice with the Seal of Geneva Quality Hallmark, rhodium-plated, "fausses-cotes" decoration, 18 jewels, straight line lever escapement, monometallic balance adjusted to heat, cold and isochronism and five positions, self compensating Breguet balance-spring, swan-neck micrometer regulator. Dial, case and movement signed. Diam. 34 mm. Thickness 10 mm. Production of this reference started in 1950.